NEW ALBANY- Mother Eula B. Jones Cameron, 87, passed away on Tuesday morning, February 27, 2018 at her home in New Albany. Eula B. Jones Cameron the daughter of the late Jessie Booth and Will Jones was born on November 16, 1930 in Tippah County, MS. She was united in holy matrimony to the late Lawrence Willie Cameron and in this union eleven children were born. Eula accepted Christ into her life at an early age and became a member of Flatwood Grove Church of the Living God in Blue Mountain, MS under the leadership of the late Bishop H.L. 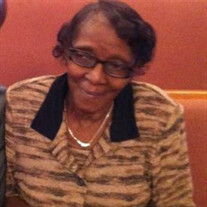 Coleman, Sr. Eula was an employee of the New Albany Public Schools where she served diligently until her retirement. Everyone who came in contact with her knew her to be a good Christian woman. She made an impact on the lives of everyone she met. The Jesus in her was prevalent and it showed by the lifestyle she lived. Services will be held on Sunday, March 4, 2018 at 1p.m. at Flatwood Grove Church of the Living God in Blue Mountain, MS with Pastor Detrick Johnson delivering the eulogy. Burial will take place in the church cemetery. Serenity-Simmons Funeral Home of New Albany is in charge of the arrangements. She was preceded in death by her parents Will Jones and Jessie Booth, her husband Lawrence Willie Cameron, and her sons Charlie Thomas Cameron and Lawyer Reed Cameron. Here to cherish her memories: five sons James (Pearlie) Cameron, and Jimmy (Juanita) Cameron of Des Moines, IA, Henry Cameron, Dr. Rayfield (Annette) Cameron, Sr., and Lawrence (Linda) Cameron all of New Albany, MS. Four daughters; Willie Pearl (David) Carroll and Hazel Jones both of Des Moines, IA. Lexie (Archie) Penson and Stella (Eldridge) Berry of New Albany, MS. Thirty- five grandchildren, one hundred plus great children and twenty-one great great grandchildren and a host of nieces, nephews, cousins, and friends. Visitation will be on Saturday, March 3, 2018 from 3-6p.m. at Serenity-Simmons Funeral Home Chapel in New Albany.